In March 2007, the team of Cannon Design and Counsilman-Hunsaker performed a Facility Audit for the indoor 50-meter pool located in the Smith Swim Center. The assessment evaluated the current lifecycle of the facility and provided options for extending the use of the facility for repair or replacement options. Regardless of the decision by BrownUniversity to demolish the existing Smith Swim Center or renovate the building and pool, a temporary swimming facility was required to allow the Swim, Dive and Water Polo teams to practice. Counsilman-Hunsaker and Cannon Design assisted the university in procuring a temporary building called the “Aquatic Bubble” to use for swimming events. 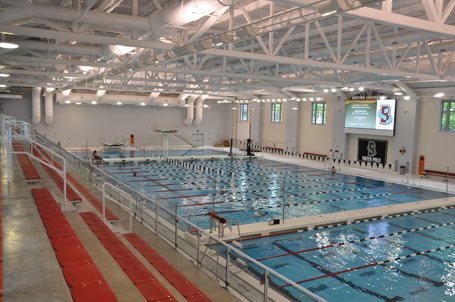 After reviewing the audit results, Brown University made the decision to demolish the Smith Swim Center and replace it with a new state-of-the-art aquatic center. Counsilman-Hunsaker, Robert A. M. Stern Architects and Shawmut Design & Construction were selected as the design/build team for the new natatorium. The new LEED Gold certified. 84,000 sq. ft. Brown Fitness and Aquatics Center supports a top-flight competitive aquatics program of swimming, water polo, and diving, and an expanding recreational program, in the Katherine Moran Coleman Aquatics Center. The roof of the aquatics center features an array of solar panels (the largest hybrid solar-powered electrical and heating installation in the United States) that generate enough power to light the building and enough thermal energy to heat the center’s million-gallon pool.